Frontback is a new photo app that I love. There are a ton of photo apps - probably a thousand or more across the various mobile platforms - however very few ever get significant traction. 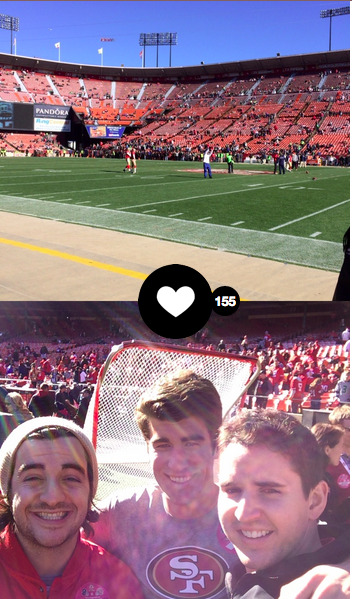 Frontback is one of the few that people are flocking to. For those not familiar with Frontback, it is an app whereby a user takes one picture with the forward facing camera on a phone, and then one photo with the backward facing camera. It creates a simple, yet powerful image. Two photos can tell a story. Either one of the photos above is an okay photo, but neither is great. However together, it’s a much better photo. It tells a story: a group of friends on the field before the 49ers game. There is human emotion, context, and feeling that you are at the game with us. Most users have multiple photo apps on their phone. In the US, the two most popular are Instagram and Snapchat. I think Frontback will become the third pillar. It fits between these two products. It has the authentic feel of Snapchat, such that it often captures human emotion void of filters and curation, with the openness of Instagram, given that the product revolves around the newsfeed and photos are all shared publicly. It’s a simple yet elegant product. It’s the simplicity that gets people to try it, but it’s the authenticity that keep people coming back. I think it’s up and to the right for this one. Partner at Susa Ventures. Previously spent time at Silver Spring Networks, Bloom Energy and Integrate. I'm into sports, food, video games and technology. That is it. Oh, and musicals.